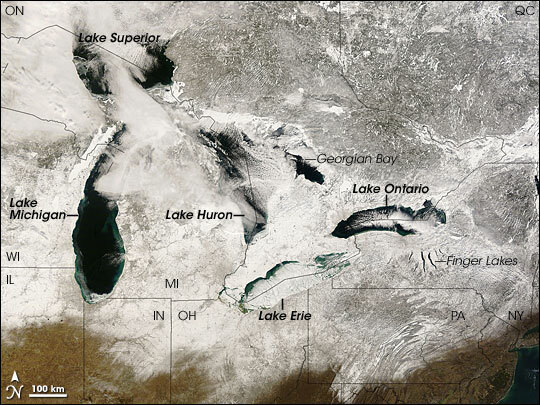 Snow cover lingered in the Great Lakes region on February 16, 2008. The Moderate Resolution Imaging Spectroradiometer (MODIS) on NASA’s Terra satellite captured this image the same day. In this image, relatively clear skies reveal snow cover that extends from Quebec and Ontario to south of the Great Lakes. The snow cover ends fairly abruptly, covering only the northern portions of Illinois, Indiana, and Ohio. Most of Pennsylvania and New York have a coat of snow. Against the backdrop of snowy ground appear the deep blue waters of the Great Lakes and nearby water bodies. 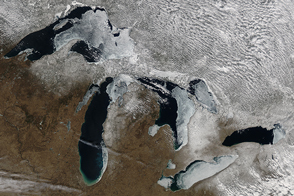 In this wintertime shot, the lakes are relatively ice-free, except for Lake Erie. According to the Great Lakes Information Network, this is typical; ice often covers Lake Erie but not the other lakes. The white area over Lake Ontario results from clouds. A month before MODIS took this picture, a study funded by the National Science Foundation concluded that Great Lakes ice cover had declined for 150 years, between 1846 and 1995. 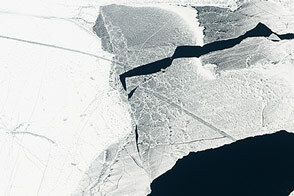 Part of a larger trend of decreasing lake and river ice cover in the Northern Hemisphere, the water bodies in the Great Lakes region had shown a decrease of 5.3 days in the duration of annual ice cover. NASA image courtesy MODIS Rapid Response team. Caption by Michon Scott. 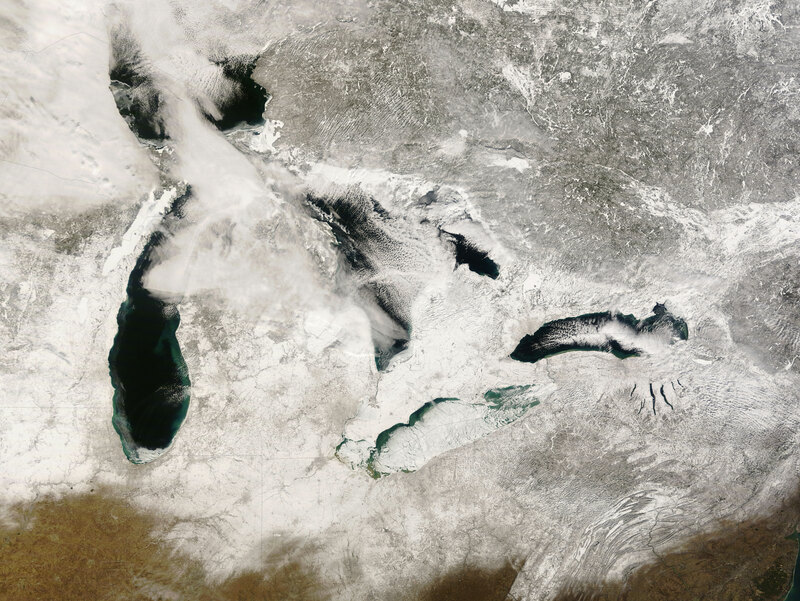 Snow cover lingered in the Great Lakes region on February 16, 2008. 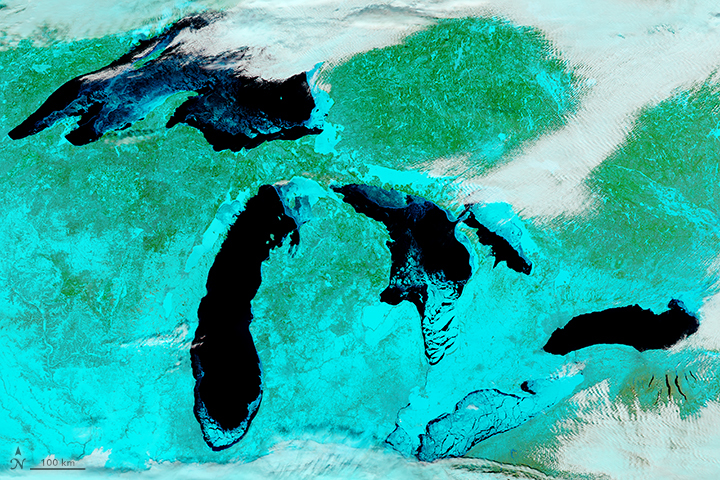 Against the backdrop of snowy ground appear the deep blue waters of the Great Lakes and nearby water bodies. 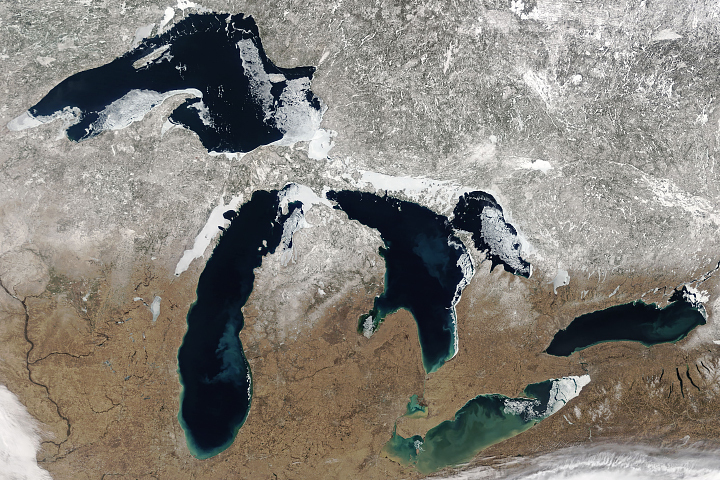 In this wintertime shot, the lakes are relatively ice-free, except for Lake Erie.